We needed a win however ugly it wasÂ and this 1-0 home victory over Elche was a real minger. Neither team looked good and the referee was a clown with no control at all over the game. CD Tenerife are now off the bottom of the Segunda division and with fellow strugglers Nastic coming to call next Sunday there’s a chance to put a run together. 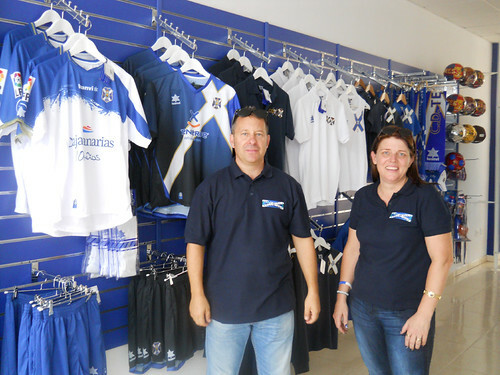 The day started well with a visit to the new CD Tenerife shop Soy del Tete in CC FaÃ±abe Plaza. Nikki and Chris have worked hard to get it ready and with a nice spread of food laid on and a large cool box of beer the mood was jolly as many of the Armada Sur gathered. All the new CDT strip is in and lots of related leisure wear as well as Armada Sur gear. They open Monday to Saturday from 10 am to 8 pm and will be pleased to see you. On to the main event and Josmar Zambrano was given his first start after a couple of impressive cameos after making late substitutions. From the start Elche looked like spoilers, their players went down at the slightest brush with a Tenerife player and the referee fell for all their theatrical rolling around. Josmar showed his skills beating 2 defenders and just failing to connect with Nino. The 18 year old always looks good on the ball but will have to learn to deal with the close attention his talent will attract, Elche set about roughing him up at every opportunity and the ref let them get on with it. 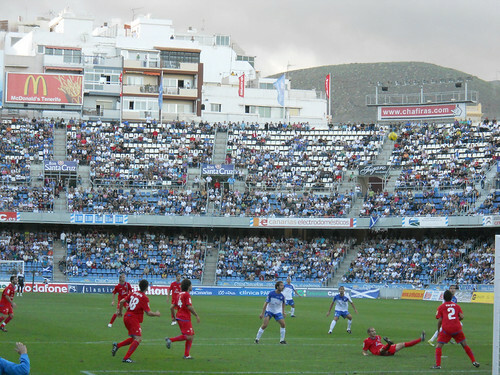 Palanca put in a testing cross that the Tenerife defence scrambled away and Prieto lost the ball to Linares who shot just wide much to the home fans relief. Josmar came close to getting his first goal but was foiled by the keeper and then in a farcical act Acciari clattered into him and then fell over himself and tried to milk it. CDT finished the first half stronger, Nino had a clear chance but Elche cleared it for a corner. Josmar was replaced by Juanlu after 54 minutes and linares continued to be the main threat from the visitors, he looked to be through on goal but Sergio made a brilliant save, tipping the ball up one handed and then grabbing it. 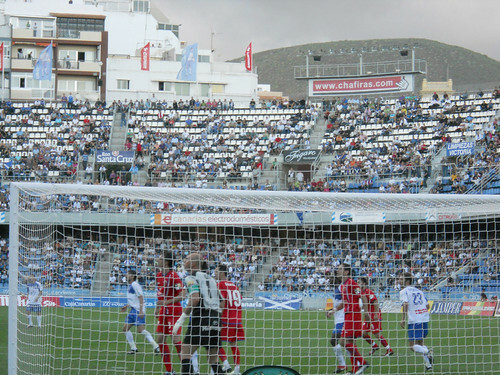 The CD Tenerife defence looked a bit better, Luna was back to something near his best form but a booking for Beranager means he will miss the next game. Former home player Angel shot wide for Elche just before Kome made way for Omar. Prieto did well to clear with a well timed header but it looked destined to be a bore draw. The big change came after 80 minutes as Natalio joined the action in place of Alvarez. His impact was almost immediate, pouncing on a rebound from a Juanlu shot to score and send the 16,000 crowd into raptures.